Prof. Kyriakakis received his BS degree from the California Institute of Technology, and his MS and PhD degrees in Electrical Engineering from USC. His research interests lie at the intersection of acoustics, psychoacoustics, and audio signal processing. His research focuses on acoustical measurement methods of loudspeakers in rooms and device enclosures, and together with his students he has developed novel signal processing algorithms for optimizing their performance. Other research topics include multichannel audio acquisition and rendering, virtual microphones and virtual speakers, hybrid headphone-loudspeaker rendering methods, and advanced signal processing techniques for optimizing sound quality from small portable devices. 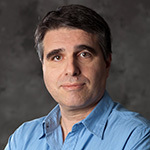 Prof. Kyriakakis has published nearly 100 technical papers, as well as a book entitled Immersive Audio Signal Processing, and holds several patents in acoustic measurement of loudspeakers in rooms, loudspeaker crossover optimization, and loudspeaker response correction using signal processing. In 2006, he received a World Technology Network Award. This organization presents awards to innovators in several areas in which technology can foster a paradigm change. His award was for innovations in immersive audio that enable new capabilities in media and journalism. Other award recipients that year included Vice President Al Gore, Google, and Space-X. Research interests include Archaeoacoustics, adaptive audio signal processing, virtual microphones for synthesizing multichannel recordings, microphone arrays for robust time-delay estimation in noisy environments, multichannel rendering.